As we are now under one month until Infocomm17, and the topic has come up on Twitter recently, I’d like to take a few moments and talk about swag. I’ve become known for the swag report from different trade shows, especially Infocomm, and tying it into the greater state of the industry. With that in mind, I’d like to go over some points that I feel makes for either good swag or bad swag. But first I’d like to go over exactly what swag is, and later how my feelings have changed on it over the years. 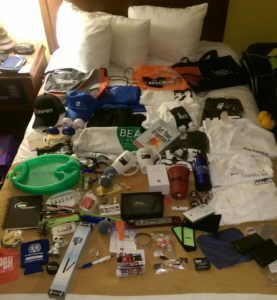 Swag in its simplest form is the little giveaways that are distributed at events such as trade shows, that have the brand name of the company giving them away on them somewhere. These can range from t-shirts to little plastic widgets, to cables or anything you can think of that will cause you to remember the company after the brief interaction of a trade show. With all that in mind, let’s cover some examples of bad swag. For trade shows like Infocomm, most people are arriving and departing by plane. With this comes restrictions on luggage weight and space. The first example is kind of related to swag, but it’s the literature that exhibitors have at their booth. Rarely will I take any paper lit from an exhibitor, however, I will gladly take a USB stick that has PDF copies of the lit. Another example of bad swag is something that isn’t useful. In the past, I used to like to collect everything imaginable from the show with little regard for use or function. Since then I’ve become much more selective. A random plastic bauble is really of no use to me in the long run. Sure I can leave the show with tons of bags of stuff, but what happens to it afterward? It usually gets thrown away. That’s not to say something seemingly made for kids can’t be useful. One year a manufacturer gave away light up bouncy balls, and I brought back 12. I then distributed them to people in the office who had kids, made more people happy and spread the word about the manufacturer. Most examples of good swag are items that are useful, and easy to get back home. Something that’s very helpful at a trade show is a cell phone battery backup. Even the little stick ones can get a phone enough juice to keep going for a busy day on the floor until you can get back to a real charger. Something along those lines that were helpful in the past was charging cables as well. A multi-headed charging cable that can be used for Android or Apple is a useful thing. Tools are useful as well, in some cases. If you can pack them in a checked bag, you can get anything home. But a useful tool that Premier Mounts gave out for a few years was a video wall gap tool. It was made of plastic and could be packed in anything to come home. Here it is, however, many years later and I still remember who gave that away, which is an excellent use of marketing dollars. Some other examples are chap stick in Vegas, t-shirts, and hand sanitizer. All useful, and all will be appreciated by the receiver. Now some tips for the would-be swag hunters out there. Don’t expect just to walk around and collect swag, especially good swag. Trick or treating is for Halloween in October, not Infocomm in June. If you want to get the good swag, be prepared to engage and hear the pitch. It won’t be a ton of time since there are 10’s of thousands of other attendees that need to be seen as well, but be prepared. A phrase I came up with last year was “If you’re trick or treating, you’ll get candy.” By that, I mean if you’re just walking and grabbing, be prepared only to get the mini candy bars they picked up at Costco. But if you engage, you may just be rewarded.